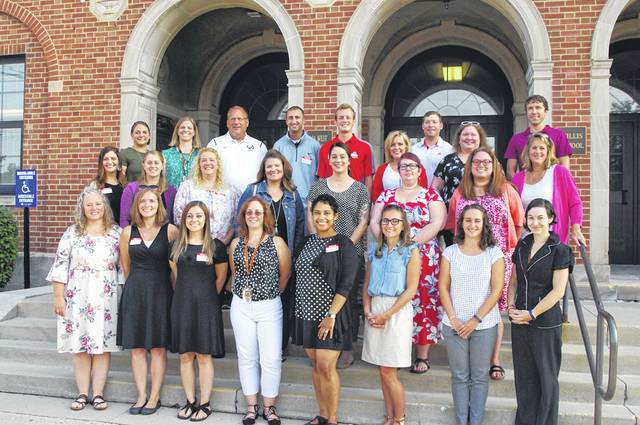 Delaware City Schools students return to the classroom on Aug. 15 but this past Thursday and Friday, new teachers and staff at the district had their own “back-to-school” orientation. During the two-day orientation, the staff learned about a variety of topics, including curriculum expectations and resources available to them, as well as practical things like their passwords, how to request a substitute, and how to use the phone systems. On Friday, the new staff members got into a school bus and got a tour of the district, along with a short greeting from the principals at each building. For new school psychologist Chrissie Hinshaw, working at Delaware City Schools means coming home, since she and her family live in Delaware. “My husband grew up here,” Hinshaw said. Hinshaw will be the school psychologist for Smith Elementary School and some grades at Woodward Elementary School. Hinshaw said she applied for the job at Delaware City Schools because she wanted to work in the same district where she lived. Hinshaw previously worked for Columbus City Schools. Columbus resident Tyler Semancik, said he was working in Marion and commuting past Delaware every day, which is what drew him to apply when a first-grade teaching position opened up at Conger Elementary. Since getting the job, Semancik said he’s planning to move to Delaware. School starts on Wednesday, Aug. 15.